The DM9000B Ethernet controller of the EM1206 can become very hot during normal module operation. 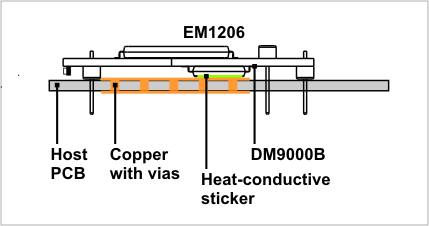 To aid the module in dissipating excess heat, a special heat-conductive sticker is applied to the top of the DM9000B. 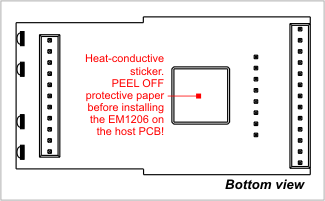 The protective paper of the sticker MUST BE REMOVED prior to installing the module on the host PCB. To further lower the operating temperature of the EM1206 we advise you to arrange a copper area on the host PCB and in contact with the heat-conductive sticker. Best results are achieved when the copper area is larger, and also when two copper areas are provided on both sides of the host PCB and interconnected by a number of large vias.